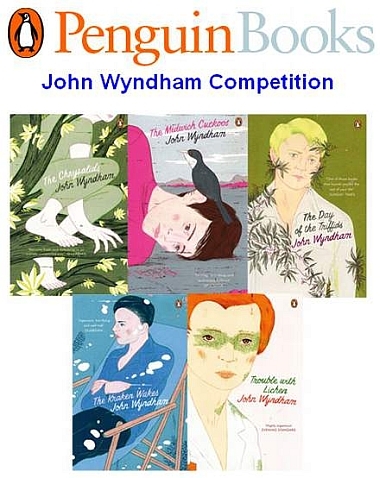 Over on the FPI blog we’ve got a competition running just now to win five newly reprinted editions of one of the classic British SF authors’ book – Penguin have given us two sets of five John Wyndham novels, Midwich Cuckoos, the Chrysalids (which we’ve just done recently in the Edinburgh SF Book Group I set up a few years back), Day of the Triffids, The Kraken Wakes and The Trouble With Lichen, all boasting very modern, new covers. The competition runs until the end of this coming Sunday (26th October) – you do have to log into the main FP site to enter, but there’s no purchase necessary and it puts you in with a chance to win a set of novels by one of the important Brit writers of the 20th century by answering a pretty simple question. And I hereby tag Ariel, Jeff VanderMeer, Padraig, Richard Bruton and George Wakley: let me know in the comments if you decide to follow up on it, geezers. And if any of the rest of you fancy trying it, go ahead! One of the things I like about writers blogging – and Neil’s web journal in particular – is the way it allows them to interact with readers and I like the fact this interaction is being celebrated by asking those readers to pick a book of his that might get others to look at his work. Its an interesting move because it will generate a lot of online discussion and linkage for his site and interest in his books, it might introduce new readers to his material in a painlessly free manner and, as Cory Doctorow, Charlie Stross and others have proven, putting up free digital version of your work (they have done it under the Creative Commons license), far from harming traditional sales seems to work to boost reader awareness and interest in your work and so help sales. I’m not sure which of the four on offer I’d choose myself – I think American Gods is a splendid story with some great use of myth, a book which could work for readers who don’t normally go for science fiction and fantasy novels in the same way his Sandman series worked for people who normally didn’t buy comics (and my signed copy of American Gods is one of the prizes gems of my collection). But it is very long and that might make it hard to read on a screen. Anansi Boys is very funny and a bit shorter while Coraline is deliciously creepy in places and there is the movie version coming up and – oh smeg, I can’t decide! But it is still a good idea. And on a personal note I’m still indebted to Neil as one of the writers who spoke up for me on their blogs back when I was going through the whole Waterstone’s firing thing a few years back; he said something like if he had his own bookstore he’d like me working in it, which is one of the nicest compliments a bookseller can get and that I was ‘opinionated but in the good way’ which seems like a reasonable description. Anyway, happy ninth anniversary to Neil and his web elves. New today that one of the best known novelist of the last half century, Norman Mailer, has died. 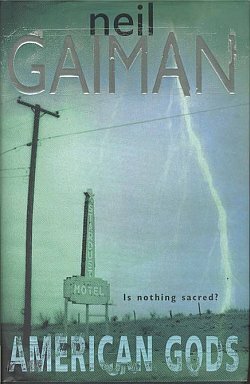 In truth I’ve never been quite sure what to think of Norman – the Naked and the Dead is a powerful read worthy of space on any reader’s shelves, but a lot of his other work I find uncomfortable. He belongs to the mid-20th century class where writers were almost the rock stars of their day – long before spoiled musicians would get drunk, stoned and into fights Mailer and his ilk were there, living it all. He even head-butted Gore Vidal once (I’m sure there are others who have wanted to). Thinking about it, it is surprising he lived so long, you’d half expect him to self destruct like Brendan Behan. Most modern writers aren’t quite the same – sure many of them enjoy a decent drink (and I’ve been lucky enough to share a few drinks with a handful of them) – but the excesses of the Mailer type writers is something more confined to musicians these days. I suppose in a way his behaviour wouldn’t have been out of place at one of Byron’s parties a century and a half earlier. As I said, I’ve never been quite sure what to make of Mailer the man – I’m not sure I’d like to have been around him personally and yet at the same time we need colourful characters in literature as elsewhere, acting out what we can’t or won’t do, almost like a catharsis, and we like reading about it, whether it was Byron and Shelley’s antic, Mailer, Werner Herzog or Pete Doherty. Part of us looks on disgusted at their selfish indlulgence and bad behaviour and another envies that they seem to be able to get away with it. Dammit, we lost a brilliant writer this week when Kurt Vonnegut slipped away, exchanging mortal body for immortal words. Of the many good writers we’ve been lucky to have it is given to only a select few of them to become that rare thing, the immortal, a writer who has books which are read and re-read across the years by a whole range of people, from the SF fan to the purveyor of ‘serious’ literature (here’s a shock, those two can often be the same). As long as people are reading they will still be picking up books like Slaughterhouse Five; they’ll still be teaching it in schools and college students will still be doing papers on it. Very few writers achieve that level of cultural penetration. Kurt took something awful, the fire bombing of Dresden which he saw as a POW during WWII, and took something of those fires within himself to fuel his writing (Slaughterhouse remains one of those books you should read. I know I’ve said that about a lot of books, but it is; there’s a good reason it comes up as one of the most important novels of the 20th century). Just the other year at 83 Kurt stirred himself out of retirement (does a writer ever really retire? I doubt the urge to put words together to express yourself ever truly dies) with a short story collection A Man Without A Country, driven by anger at Bush and the dire effects on America and the world that odious chimp has had. I hope I’m still feeling the urge to stick it to the man when I reach that age (although it would be preferable if by then we all learned to be nice to one another and I didn’t have anything to have a go at; gladly would I hang up my sarcastic barbs for that to happen). In an interview I found on In These Times he express his disgust with Bush’s policies: “I myself feel that our country, for whose Constitution I fought in a just war, might as well have been invaded by Martians and body snatchers. Sometimes I wish it had been.” Cool and clever to the end. By curious coincidence some of the folks in the book group were just talking a few days ago about how we should cover one of Kurt’s books; he is one of those writers that a lot of people think that about – why not just do it? Pick yourself up a copy of Cat’s Cradle or Slaughterhouse Five, sit down, read it. Then pass it on and spread the words. On a related not Ariel and I were discussing how odd Kurt would die from ‘brain injuries’ a few weeks after an accident which came after this respected elder statesman of American letters (and a veteran who actually served unlike the current chimp-in-chief) so publically attacked Bush’s government. Natural causes or a sinister, shadowy conspiracy… Okay, probably not, but I’m sure somewhere right now it is being written up as such on some conspiracy blogs.